I've had such a busy week and a half, I've spent a lot of time with my boyfriend and I managed to score two trial days at an Insurance company who will hopefully get back to me and give me the job. Hopefully anyway. My 21st birthday is quickly looming and tomorrow I'll be a proper adult, I'm both excited and dreading it at the same time. Sleep is something I've never been good at, I love it a lot don't get me wrong but I find it so hard to actually be able to do. As soon as I lay down my brain just goes crazy and I can lay there for hours and not get a single second of it. I've always been looking out for tips on getting a better nights shut eye but not much ever seems to work, so the fact that I'm trying to sort my sleeping pattern out now isn't going as well as I'd hoped. When I do happen to actually sleep I still never get a good night. I suffer from sleep paralysis way too often and it causes the quality of the sleep I get to be plain out awful. After trying pretty much everything to help myself sleep properly, and better, I finally found a few little tricks that combined, have actually helped me sleep better at night so I thought I'd share them with you all in case any of you might find them helpful. Obviously these won't work for everyone but they've definitely helped me and I'm sure at least one person reading this will be able to take something from it. 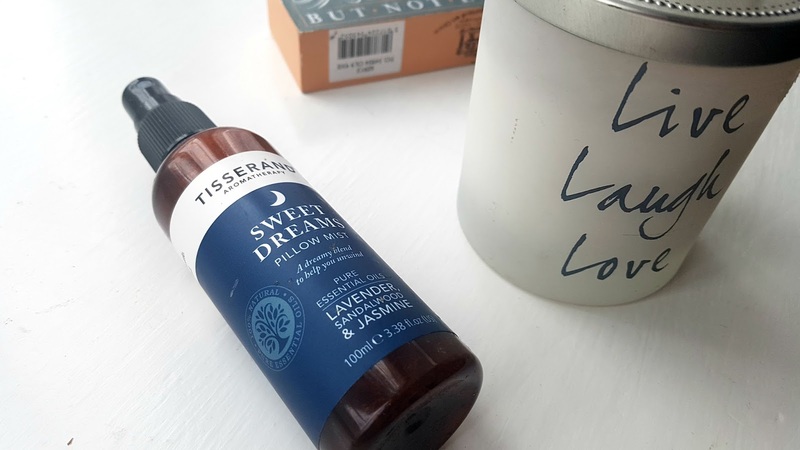 Firstly I thought I'd mention this Tisserand aromatherapy pillow mist. It's lavender, sandalwood and jasmine and smells absolutely gorgeous. My boyfriend hates the smell but I think that's just a typical guy thing. I spray this around my room and on my bed sheets every single night, it has such a relaxing and calming scent and really helps get rid of any stress and tension in my mind and body. I then like to turn my lights off or at least dim them (having a dimmer switch on my light is hands down one of the best things I have) and I make a cup of tea and actually get in bed. Now I'm one of them people that can't just get into bed and go straight to sleep. I normally like to put my phone on airplane mode so I'm not tempted to check it, I use my phone a lot so this is always extremely hard for me but it keeps my brain way too active when trying to sleep. I like to read a book or get my notepad out and write some blog posts or ideas or pretty much anything. Sometimes I find it good to write out my thoughts or what's worrying me just to get them off my chest so they aren't as in my head for when I try and sleep. This just takes a lot off my mind and I tend to think a lot less when doing this, it's nice to get them out. Normally I'll spend like an hour just chilling, then I actually try to go to bed. I still can't hit the pillow and instantly fall asleep, but after this routine I find it a lot easier to drift off and my brain doesn't feel anywhere near as heavy as normal. Do any of you struggle with sleeping? How do you get around it and actually get some shut eye? I'd love to know if any of you have any tips or know of any products that are helpful, we can all help each other down in the comments! 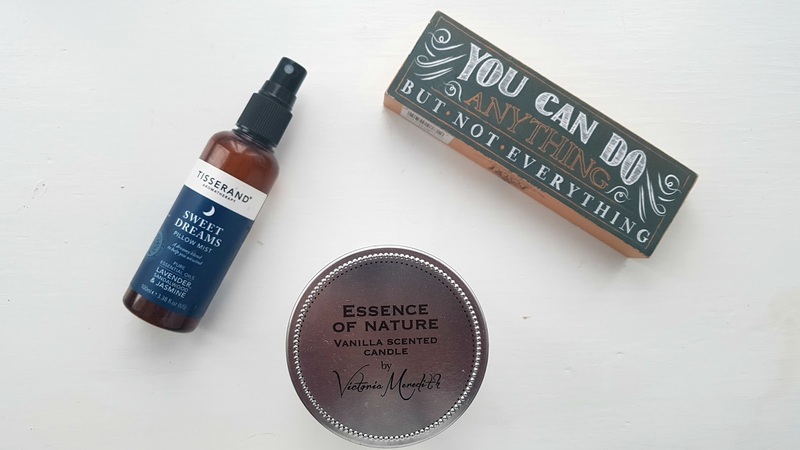 I love doing lifestyle posts like this, the main root of this blog is helping people and advice with everything, so if anyone has any requests relating to anything then please let me know! I think a beauty and lifestyle niche suits me really well and that's going to be the main focus over here. If you're interested in seeing more of me then follow me on bloglovin HERE, I'm hoping to reach 1.4k followers by my birthday on Tuesday, I'm pretty active on there too so I'll follow you back and if I see your posts in my feed I'll always head over and read it and leave a little comment. I love the community around blogging and reading other peoples thoughts. I love pillow mists! This one sounds absolutely wonderful! My boyfriend is the same with stuff like that haha. Putting your phone on Airplane mode is such a good idea - I'm always tempted to check my phone when trying to nod off. I have tried absolutely everything. The #1 thing that has worked for me is to have a "no thinking" rule when I go to bed. If I think about anything, even if it's good thoughts, I can't sleep. So I have to force myself to only think about how comfy my bed is and nothing else. Sounds silly but it's working most of the time. To be fair I do that sometimes haha!